I finally took a break from travel to say home a weekend. Friday, I met up with Enrique, Jose, and Matt at the Library for the American Outlaws US v Haiti Gold Cup watch party. Afterwards we walked across the street to Anodyne and played billiards way to late. I showed up late for the AMRC guideline training, but made myself somewhat useful by helping set up the full strength anchor at the bottom, getting hauled to the top (wee! ), and then running the main for lower sequence. I left early for Mike and Tammy's wedding - so I really got it from Zak and company. Mike and Tammy had a small, quaint wedding in the South Valley. I played the role of photographer and did my best to get a few nice shots of the ceremony and reception. I think they turned out fairly well. 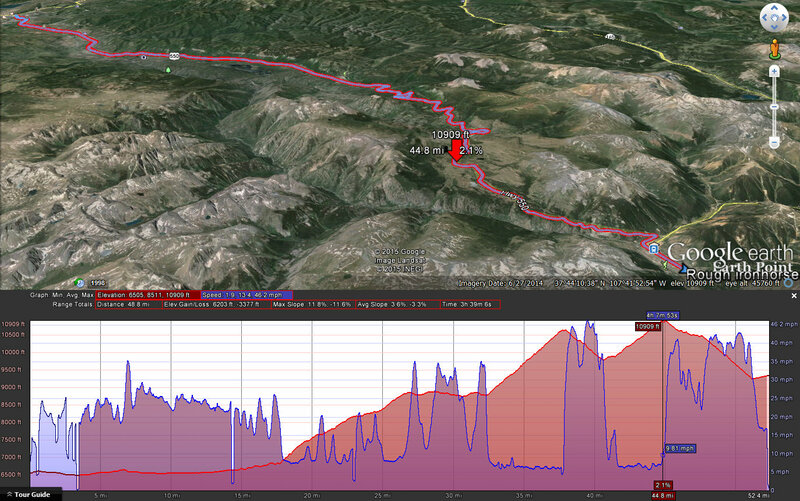 On Sunday, Mike, Allison, and eventually Mike #2 climbed the 4000' up Winsor to the Santa Fe ski area on bikes. The rivers were up so we played in the stream crossings to avoid the summer heat :) I ripped the descent and only managed to crash hard once! Stupid bush got me. For the 4th of July, I decided to take Jason up on the offer to sail on the bay with the fireworks show. I landed on Friday afternoon, and we went straight to the Torrey Pine Sailing Club on Shelter Island to jump on the 25' Catalina. It was a fairly quick sail, but good got me some more skipper time that I could put toward an ASA certification. The following day, Jason did a big bike ride while I took Chama on a 6 mile loop in Penasquitos Canyon. I do like the idea of having a dog, but I travel too much to make it practical. Jason and I rode the 20 miles to the marina on Saturday because the holiday crowds were insane. 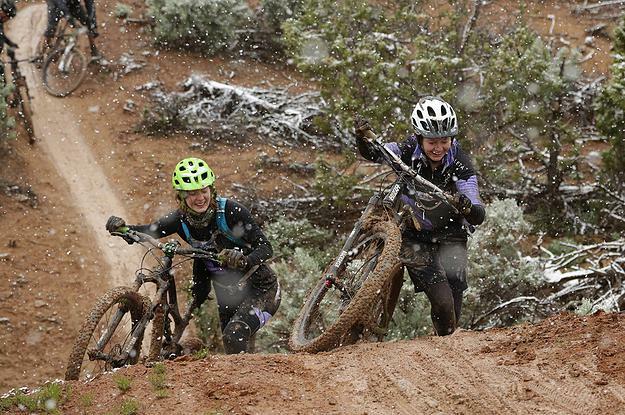 Plus, it's fun in a sadistic way to ride with an ex-pro racer. Jason's so hard to hang with - he's tiny and leaves near-zero draft for me to catch a break. We sailed to Catalina Island on the 24' Newport with a Jason's friend, Justin and his girlfriend, had pizza and beer and then meandered around the bay waiting for dark. At 9pm, the 3 barges in San Diego Bay fired up their shows. We were motor-sailing between all of them. The reflections off the water were spectacular! I did my best to get a few photos, but the movement of the boat made it tough. Sunday, we did a check-out sail on the 27' Catalina with a couple joining the TPSC. I didn't get any tiller time, but it was still a great sail with 12+ mph winds. We drove straight to the airport from the marina, and fortunately I was delayed 45 minutes, because I was able to watch the US dominate Japan in the 1st half of Women's World Cup final with everyone at Gate 8. I headed to Denver for 3 days of rain and NREL meetings and then finally back to ABQ. I flew out to Oakland Friday morning and linked up with Matt in the city. We did a great little tour of the town: we hit up all the Andy Goldsworthy pieces in the Presidio (watch Rivers and Tides), went over to ride the slides in Seward Mini Park, got a burrito in the Castro (in celebration of the Supreme Court ruling...although the Mission District burritos are supposedly better) and then had a beer in Mission Dolores Park. I love that park! Mid-afternoon I split with Matt and went over to Chris and Anna's to watch the women's world cup game and then drive up to a great AirBnB I reserved north of Bodega Bay. The house was great with a sunroom that looked out onto the rocky coast and Sonoma Coast State Park trails along the cliffside. I spent the morning exploring the beaches while Chris and Anna did a long run. Then Russell met up with us and we all got brunch in Cape Fear Cafe in Dunkin Mills. The drive was spectacular along the Russian River because the sun was finally breaking through the morning marine layer. We headed up to a mountaintop retreat (cult center?) 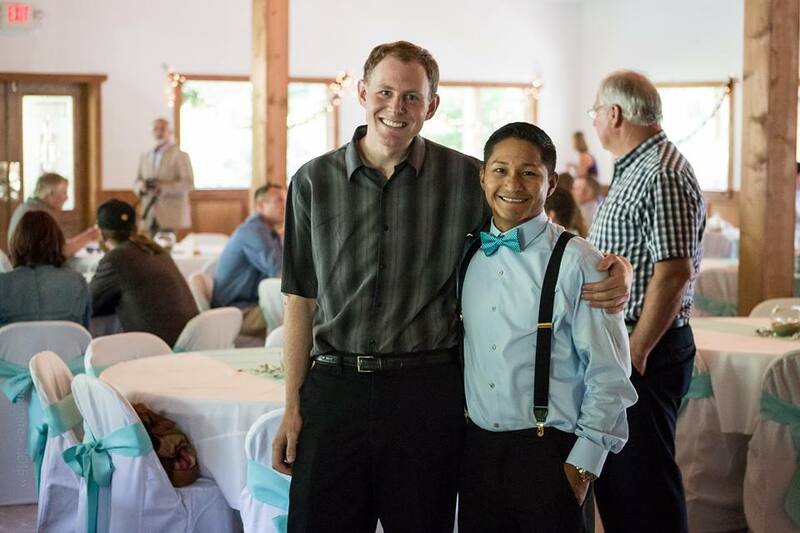 outside of Tyrone, reunited with a great group of friends, and witnessed a charming wedding. The reception was in Bodega Bay and hosted a number of characters from the SOTD (Stallions of the Dawn crew from NREL '06), sailing trips to BVI and SVG, and others along the way. Sadly, Paul and Pearl didn't make it, but with their newborn, they can certainly be forgiven. It was great to have T$, Russ, Chris, and Dro together again - we're a crazy gang and sooo much fun. Where else can you talk about (and plan) renewable energy startups and nudist communes in the same breath? When all the toasts, dances, and G&Ts had come to an end, we retired to the AirBnB place, assembled a 500 piece puzzle (for some reason?). I couldn't get everyone onboard but I took a midnight walk on the beach with T$ and her fiancé. Sunday, we had a lovely brunch with the wedding crew, and then retreated to the bay area again. Chris and Anna took me to a great Berkeley Indian place, Vik's Chaat, for dinner and then I was off to the airport. Great weekend with amazing old friends! I spent the week at IEEE PVSC in New Orleans. Conference was good, but I'm shifting away from PV physics to systems integration so it didn't hold as much interest to me as it normally does. Plus, this was my 5th time at the conference talking about arc-faults so it's getting slightly old. Got a chance to meet Rachel and Jack for dinner. Not much chance to see that side of my family since they're so far away. I took advantage of the easy French Quarter access to social and have a beignet and hurricane or two. The highlight as usual was the Sun Run. We managed to get a team together this year and Hot Carrier Injection tied for first place. Thanks Jack and Birk! I ran the 2.81 mile 5K in 18:33 (20:45 pace) and egged Jack on enough to have him out-sprint me at the end :) But either way, I earned my 5th Larry Kazmerski tie. On Saturday, I grew restless and went up to camp with Kelley and crew for her birthday. I found them at sunset at Lower Hondo CG. Kelley, Francisco, and Amanda had just finished Wheeler and were completely content to relax by the fire. Stephanie and I just showed up to party and eat s'mores. I randomly met my work colleague in the campsite, so I asked Carrie to join us. Matt rolled in about 10:30 and Alyse ended up nearby. At 0700 the next morning, the AMRC crew (Matt, Alyse, Jeff, and I) met at TSV parking area - turned incident base to search for a missing 61 year old male. Instead of getting a blackhawk ride to the top, we had to hike the 4200 ft up Yerba Trail to Lobo Peak. Justin from Atalaya SAR, jumped on our team and we ran a long, hot mission up to the ridge, down the ridge, into the steep drainage, and eventually back to the trail. After 7 hours we heard the death code come across the radio. We were only 0.1 miles from the find, so we traversed to meet Team 31 and assess the situation. I couldn't call the IC directly (no coverage) so our team headed back to base to sort out the recovery. I let IC know the situation 2000 ft, 1.7 miles, and 20 stream crossing separated the team from the TH. They needed the body bag, litter, etc. At about 6pm, I made the decision to go home and not help out with the recovery (a combination of fatigue, plenty of help on scene, and busy work day Monday). Alyse and Matt did however bring supplies up to the group - putting their climbing somewhere north of 6000 ft for the day! Bravo! The body was recovered somewhere around midnight, putting the end to a week's worth of searching and providing closure for the family. This mission was well covered in the national news because the patient was the White House Chef for Clinton and Bush. Some of the reports include: ABC, ABC again, New York Times, CNN, NPR, Taos News, and HuffPo. I headed back to my childhood home in southern Illinois for a week. Aside from writing a conference paper and preparing/defending a DOE proposal via webinar, it was a relaxing visit home. First few days were cold and rainy, but it eventually got into the 90's with the standard 80+% humidity. 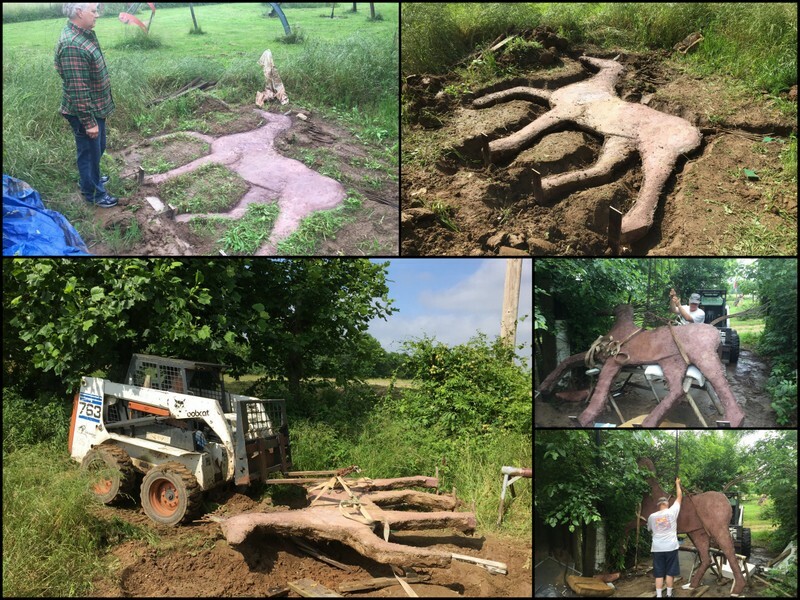 I helped my dad set up the first half of his latest sculpture: a jousting knight for the Abbey Ridge Brewery. I also helped with his latest film project by manning the mic boom for a couple scenes while he directed. The film included a climbing segment so I brought a bunch of gear with me from Albuquerque. I was the safety officer and had to set up a few shots of the actors trad climbing. It wasn't easy since they didn't have any climbing experience, but we made it work. The route I liked the best was at Devil's Stand Table in Giant City and completely stunning--so it should look great in the film. We were lucky to have a stunt double to actually lead the route, otherwise I was going to have to lower the actor onto the face. The final shot of the climbing scene was the climber falling, so dad and I set up a green screen behind the trampoline with bamboo. Hopefully it all worked out even with the 13-year cicadas screaming. For the rest of the week, we took a couple bike rides, delivered art to the Alto Winery, loaded and distributed mulch, setup the pool, listened to the Woodbox Gang in Carbondale, played board games, and hiked the trail. On Saturday, it was Ed's wedding reception. Ed and I were best friend's in jr. and sr. high school and I went to Peru with him a couple times. The wedding was a small gathering, but it was nice to finally meet Danielle and see friends from years ago. Terry is farming and Ivan is trucking. Ivan also started his family with a couple kids. Steve's mostly the same: still scheming to get back to Peru and probably happy to have his kids out of the nest. At the end of the trip we swung by Washington to visit my grandparents. They are still living alone in their house despite the growing list and severity of ailments. As an early Father's Day gift, the family gave grandpa shirts to help him get back to his wife. With his alzheimer's he's been known to get lost from time to time. I arrived in the late evening in Durango and took a stroll. There were heavy storm clouds to the north and I knew the passes were going to be getting some precipitation overnight. After catching up with Bri and Josiah at the check-in/party, I went over to Mike's parents condo and prepared the shuttle to Silverton. Somewhere around the 10,000 ft mark the rain turned to snow. It kept getting thicker and I began to think the ride would be cancelled for the 2nd year in a row. We dropped the car off and at 10pm, there was 20 ft visibility and 3 inches of sleet/snow on the roads. We went to bed with fingers and toes crossed. The ride was a go at 6am and Mike, Allison, and I geared up. They were poaching the ride from the condo, so I rode down to the start alone. I found a spot in the 2nd row with Josiah, Briana, Tony, and Sam and we counted down to the start. They were all giving me a hard time about my thick winter gloves in the 55 degree morning, but I thought they might be needed later. When the whistle blew - we were off in the front peloton. By mile 2 Josiah said he wanted to drop off, but I yelled to stay with the lead group and bridged the gap. Unlike last year, the police transport was quick enough to spread out the riders and it was much safer. I found my spot in the front 10 folks and happily sat in the draft. Around mile 5, I could feel a little bouncy softness in my bike and feared the worst. When we hit the train tracks in Hermosa (mile 11), my front rim hit the pavement and I was forced to pull out of the 6th spot in the ride. I watched as the first set of hundreds of riders passed as I pulled out the pump, and the next wave of hundreds of riders pass as I popped the wheel off, and then another set of riders as. As my friends passed they said, "Oh no, Jaaayy. Sorry!" I pumped up the front and decided to ride before a full tube replacement. Hopefully the slime would do it's job. It did work fairly well, but I didn't get enough air in, and I wasn't able to stand for any of the first climbs. At the first aid station, I got a floor pump and returned it to 100 psi (from 20 psi!!). The rest of the ride was hard, but mostly uneventful. I got over Coalbank slowly and at a low heart rate. I couldn't stand at all because my right hamstring was on the verge of cramping. After a ripping, freezing, water-covered descent at 45 mph (glad I brought those gloves now! ), the snow started and wind howled. It was painful for 10 minutes starting up Molas, but then relented. I climbed weakly and on the last 300 ft to the pass, my hamstring finally cramped up and I had to grab it hard to keep it operating. 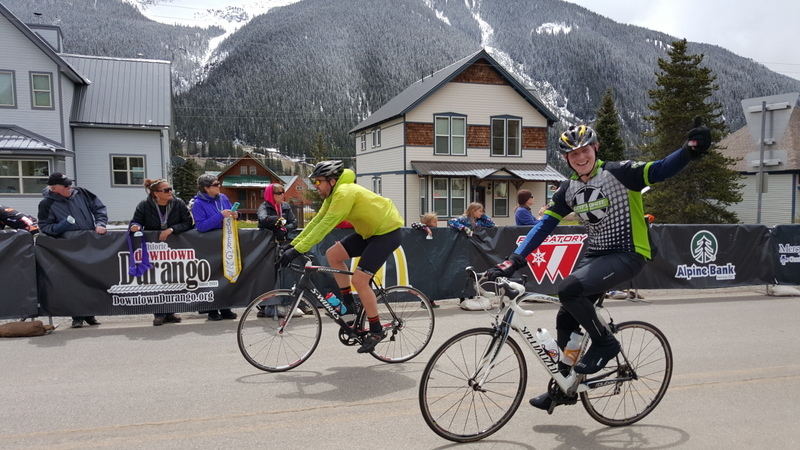 I tucked the hill into Silverton and rode strong to the finish as all the people lined the street yelling, "Come on, you can beat the train. You're going to make it!" 3 hr, 40 min for my first Iron Horse (6300 ft of climbing over 50 miles). Not bad considering I flatted and cramped. Plus, I showed up somewhere around when the train came in: I think it got to town before me, but hadn't finished parking (so call that what you will). Had a couple drinks with the crew at Montanya as the snows began and then shuttled back to the condo with M&A. We rallied and hit the town with everyone that evening. What a fun bike gang. On Weds, AMRC got the page-out to search for a 24-year-old female missing in the Sandias. I had work obligations, so I didn't make it up Weds or Thursday (but they did close down the crest road past the ski area so I couldn't finish my weekly road bike crest climb). It was my Friday off though so I headed up to the 10K with the rig. Andreas, Craig, and I were assigned to Team 36 and sent out into very difficult terrain east of the crest road to look for clues that the patient had started hiking downhill. It seemed like a long shot-especially since someone had found the car keys up at the top of the mountain. We reluctantly searched between 9400 and 9600 feet for miles, crossing deep gorges and lots of downfall, and occasionally in snow/graupel. It was terrible and we found nothing except a few large footsteps, 3 party balloons, and the downhill MTB trail that I'll like to check out again sometime. After 6 hours of that nonsense, we returned to incident base, chowed down in the police van, and were reassigned. To our luck, there was a break in the police case: a witness saw the subject on the cliff-side of the crest railing at a particular location. The witness reported that the patient looked very troubled and kept returning to the same spot along the cliff. I followed the APD officer up to the crest and he brought us south to the location. We built and anchor and rapped down the ~70 ft cliff and began searching. At this point, the weather had turned further south, the snow was picking up and coating the steep low-angle terrain. The winds started picking up as well. Craig, Andreas, and I split up to search along the cliffs. It took some time, but as we keep working our way down the hill, Andreas finally made the find. I radioed in the death code on the police radio and our search changed over to a recovery mission. It took quite some time to get APD down to take photos, so I ascended back up to get gear for the low-angle operation: a 200' rope, skedco, and rigging kit. At this point the lightning-thunder gaps were getting shorter, the winds were up to 30 mph, and it was snowing like crazy. It was very difficult to navigate the terrain or see into the wind. I ran the sked and rope down to the body. After the APD officer got photos, Andreas and I tied her into the rope system, put her in the body bag, and then packaged her into the sked. I went back up to get a 3:1 system setup, but found that that 200' rope wasn't going to make it, so I spliced it to the main for the high angle. I built a quick re-direct to get the rope up the low angle gully and Andreas manned the litter. I took over at the re-direct and we connected the sked into the belay the base of the cliff, added a tagline, and got the sked to the edge. Unfortunately the sked caught a minor underhang and the tagline attached to the foot was nearly useless to dislodge it. Kerry managed to get a hand to the sked to dislodge it and the haul team pulled it up over the edge. The three people below loaded up gear and climbed up with a hand line north of the high-angle system. 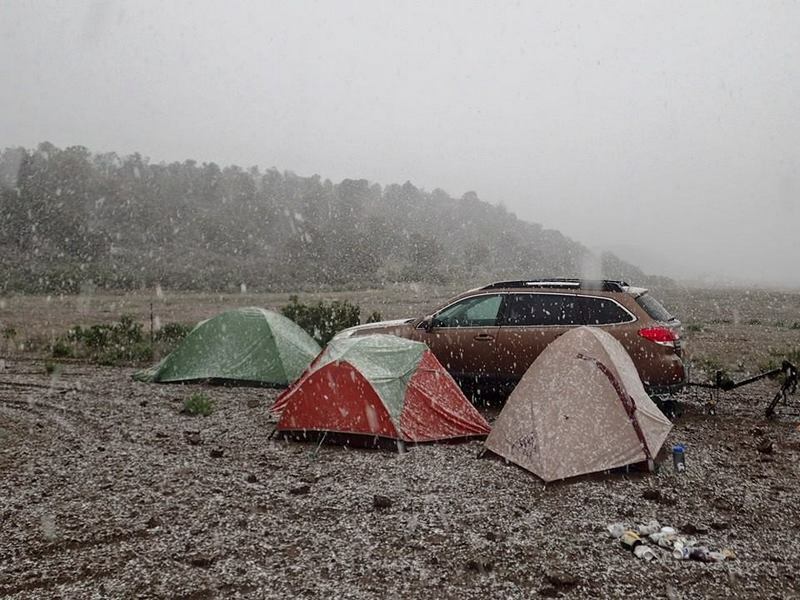 Lightening was within a mile and the winds were 40-50 mph and there was 3 inches of snow accumulation at this point. It was my 13th hour of the mission when I jogged into the crest parking lot. We fled the storm, debriefed at the ski area, set gear out to dry in the cache, and I headed home for much needed sleep. KRQE May 11, KRQE May 12, KRQE May 13, KRQE May 16, Albuquerque Journal May 16, KOAT May 16. On Weds, the ARMC crew got to work with the BCFD/BCSO Rotary Team to figure out how to package for hoist operations. We also checked out the chopper. 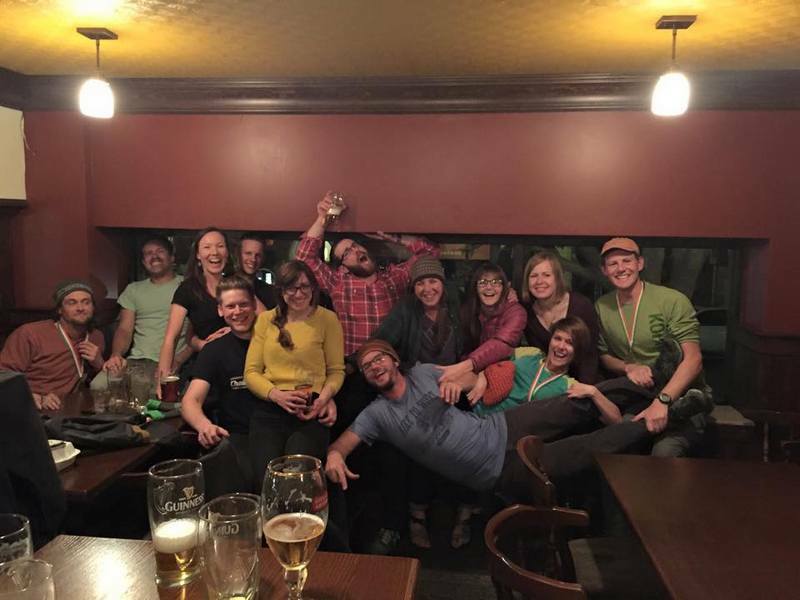 Thursday, Folks got together for a chill south foothills MTB ride and pizza dinner at Bonnie's. Friday, we drove up to Cortez and camped out. The weather was cold and wet. In the morning it was 35 degrees and snowing lightly. I was on the starting line scraping mud out of my bike cleats minutes before the starting blast went off. It was an honor to be the lead-off rider for Josiah and my duo team, VaJayJoe. The start of the race involved a sprint to our bikes, so I did my best to get to the front of the group before clicking in; I did fairly well and was in the top 50 people or so of ~400 teams leaving the staging area. I hit the gas to hit the trails in good position but entered the singletrack breathing hard. At mile 5 the fat snow started dumping hard, but the course was tons of fun - great flowy singletrack with small rocky obstacles and some spots of exposure. By mile 8, the race was spacing out and I was riding at a normal pace and my sunglasses were fogged up so I put them in the collar of my shirt. Not much longer I caught my backpack on a low tree branch, ripping my mesh pocket with my garage clicker (stupid) and flinging my glasses somewhere. I was in tight trees with people behind me, so I just kept riding. The mud was really getting insane by mile 10 and I could barely ride large sections without fishtailing everywhere. Some people were taking the decents really slow--which was driving me crazy--but ultimately kept me on the trail, which is probably a good thing. In the rib cage I was stranded behind someone riding the brakes but for the last 5 miles I was mostly clear and just struggling to keep the bike moving in the right direction. A one point, I couldn't make a climb and as soon as I put my foot down it slid in the mud and I fell on my bike. The final drop back to the starting line went well and I was happy to be turning to torch over to my teammate, but when I got there they said there was a 2 hour delay. I got in at 1:40ish and in those conditions, I thought that was a solid effort. I hosed my bike off for a long while and went to warm back up in the tent while the other two teams came in. At noon, they cancelled the race. We had spaghetti and beer, and most racers headed home. We decided to camp another night, so we could ride the course in the morning. The storm broke and we had slow races (trackstand practice), an RV party with Mike and Tammy, and a great camp fire. In the morning everyone went out for a ride, but my bike was in no shape to make another full lap with chain rust and dirt so I bailed after 6 miles. I've been in a little funk of late, but this last weekend's really jolted me back to life. Friday, Kendrick and I headed to Santa Fe Ski Area to take a few laps on the Nambe Chutes with his dog Sarah. The bottom was melting fast and we ended up walking over a number of mud patches. By the halfway mark, we were in much better shape and we finished the skin just as the sun was hitting a few nice couloir lines. 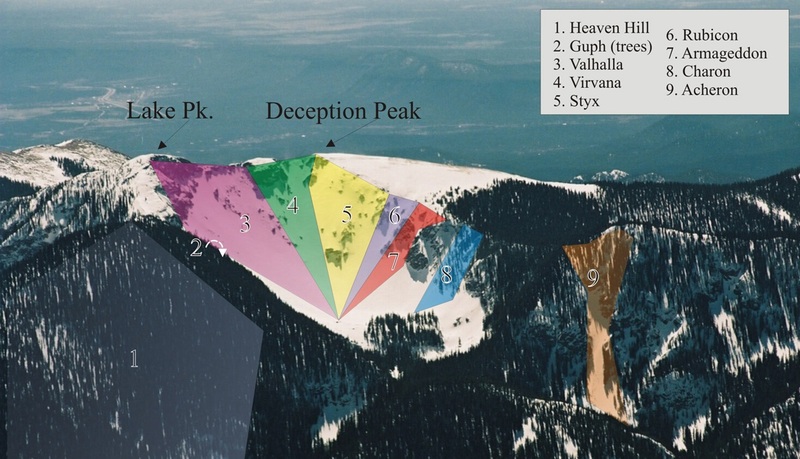 I dropped into an easy chute on Styx below Deception Peak and carved up the spring corn. Kendrick and Sarah were close behind. Luckily another group had put in a bootpack to the top via Rubicon so we didn't suffer too much on the return. Our 2nd line was far more interesting with a 55 degree entrance on Armageddon. 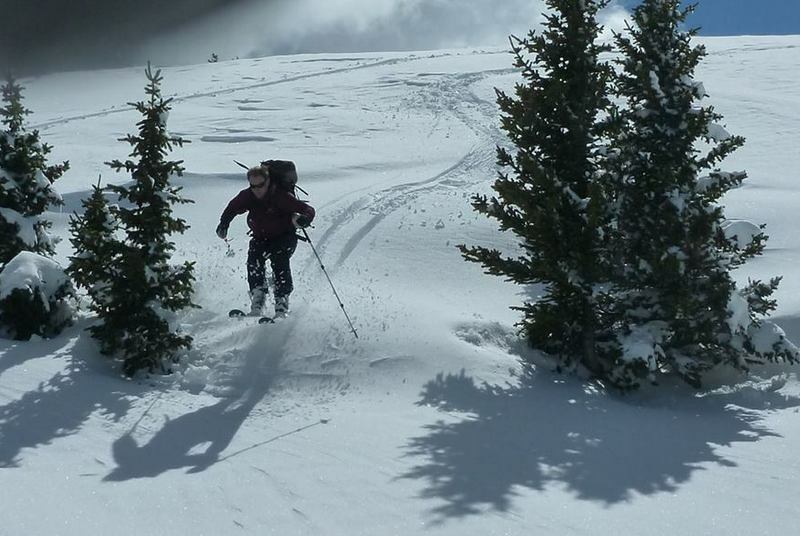 A snowshoer was even kind enough to send us a few pictures of us dropping in. After lap two, Jeremiah and his friend showed up, but we decided call it and made our way back to the ski area base. Kendrick and I grabbed pizzas at Il Vicino in Santa Fe and then worked our way out to Diablo Canyon. He convinced me to climb Post Moderate (though we ended up on Hellboy at the top) to level the score from the skiing. Kendrick made it look easy on lead - I, on the other hand, managed to unconfidently work my way up grunting and cursing. The crux of the 2nd pitch gave Kendrick pause and he had to downclimb and rework the problem a couple times. On top rope it wasn't as daunting and I pulled though. We rapped off the mid-pitch anchors as AMRC members started showing up. The OCC crew, fresh from their NM SAR Field Certification testing, arrived at Diablo around 8:30. They were given a mock scenario to find a fallen climber, Shaniqua La Fonda, based on a few cell phone GPS coordinates. My team ended up wandering around east of the canyon for a while until the patient was located. We brought up ropes and rigging kits for the low angle rescue and set up 4 sequential anchors down to a trail to IB. I finally got my Baofeng radio programmed and it came with this very nice feature where you can listen to the radio until a communication comes in - we selected the mariachi music on 94.7. After a long, slow lower we made it back to the camp at 1am, debriefed, and then pitched camp. In the morning, we started with the test-out stations. I manned the rigging station with Hans and Angela. Once everyone was finished, I went to the Styx wall and did a couple 5.7 top-rope climbs (one by belaying myself with a grigri - that was new). After lunch we went down to the Rio and cooled off. Kevin, Sarah, and I piled into Kendrick's Jeep and off-roaded a little on the way back to camp. A storm was moving in, so we used the afternoon to watch Cliffhanger in Justin's van and go spelunking at Buckman Cave. The OCC crew went up there without a rope - so it was only Kendrick, Gio, and I that got any quality cave time. We covered much of the same areas that Mike and I explored a couple years ago. But this time we went a little deeper to a place labelled "Hell" with an arrow down a ~60 ft pit. It was a dead-end, but that was the farthest I've gotten so far. There is another big rappel from the big room with a triangular hole in the ceiling - guess we'll get to that one next time. I did also manage to avoid ascending the 1st rap with a tight squeeze and 20 ft of aid climbing. The first drop can be avoided in the future to save the rope for the lower sections. As we got back to camp, the BBQ party was in full swing. The OCCers passed their tests so they officially joined the team. They were given their 8 mm cordelettes and Verena was awarded a grigri for her outstanding work in the class. A fire was built up and then we got the idea to have radium release hitch tying races. A week before, I claimed I could tie one in 30 seconds, but only got it down to 35 seconds before sharing the video with the class. Supra soon after sent me a video on FB that showed a 30 sec radium. So now it seems this has become a thing. I was paired up with Nick, the new guy, and I lost terribly... Supra beat him, and Lance won it all in the end. How funny to be tying knots at midnight. I also partook in some champagne and a couple beers at the fire, breaking my 26-day alcohol-less stretch. I had been trying to get a little more fit for mountain biking racing, but this party seemed worth breaking the drought. Sunday, I was originally slated to ride the high road to Taos with Briana and company, but she got sick and cancelled. I chose to use my sunday to ride to the Santa Fe Ski Area. It was a tough climb and my knee started bothering me midway up. I dialed back the speed and eventually made it to the top - 30 miles and 4400 ft of climbing. Saturday was the OCCers last training before their final testout weekend. Paul ran a good scenario in which his daughter had an open tibia fracture (complete with animal bone and tomato sauce blood) on the Big Block shelf. I came in with the support team and built an anchor with Andrea's trad rack for the patient, Verena, and I. The rock was terrible (crumbly), so when we started putting the litter attendant, patient, and 2 support folks on it, I got nervous and added a couple more pieces for a total of 5 cams. Verena did a great job of taking care of the medical components and paul worked the litter well. I haven't seen something like this done before, but we had 2 lines for the toe and head of the little tied into the anchor to stabilize it for patient loading. Paul was still too far out to help, so I built a tiny 3:1 off the master point on the litter system and pulled everyone in. To transfer the patient to the Stokes, we clipped her into the main and I lowered her on a munter. After she was fully packaged, the upper team raised the litter off the rock shelf; Verena and I let out the head and toe lines; and then I let out the 3:1 system and the litter slowly swung back out into the free air. They transitioned back to a lower and everyone reached the ground safely. The OCC then ran a quick low angle back to the road to reiterate wheeled litter transport. Overall it went well, but at 2 hours the whole thing took much too long. The afternoon was devoted to a few specific skills: rap/ascension transitions and knot passes. Seems like there's been tons of mountain rescue activity lately! On Thursday, the team held a high angle rescue training to practice vectoring during edge transitions. I also worked on my system for transitioning from horizontal to vertical stokes and back: a block and tackle system tied to the master point and base of the litter is simple for building MA and getting it done - though I need more than a 30' 8 mm rope for getting it to 5:1. Friday, I spent the day planting 10 Cypress and Austrian Pines at my house. I also got a big load of mulch to redo the backyard landscaping after years of 40-50 mph winds stealing my woodchips. By the end of the day the driveway was clear and my back was aching. On Saturday, I was ready to work with the OCC class at the AFD fire tower, but at 6:30am a mission text came in. Andy, suggested I joined a few other AMRC folks to go out and look for a 51 year old female who was lost in Manzano Mountain State Park. We spent the day running a grid search in the Park, but with no sight of the woman. The following day, the sad news came in that the woman was found dead. Saturday night was Briana's birthday party. I've been taking a month off alcohol so I DD'ed for the Effex revelers. Quite the scene with ~10 friends in the rooftop moshpit. I got everyone home sometime around 2am and passed out from sheer exhaustion. Sunday, I joined Mike, Allison, Jordan, and Tom on a mountain bike ride in the south Manzanos. 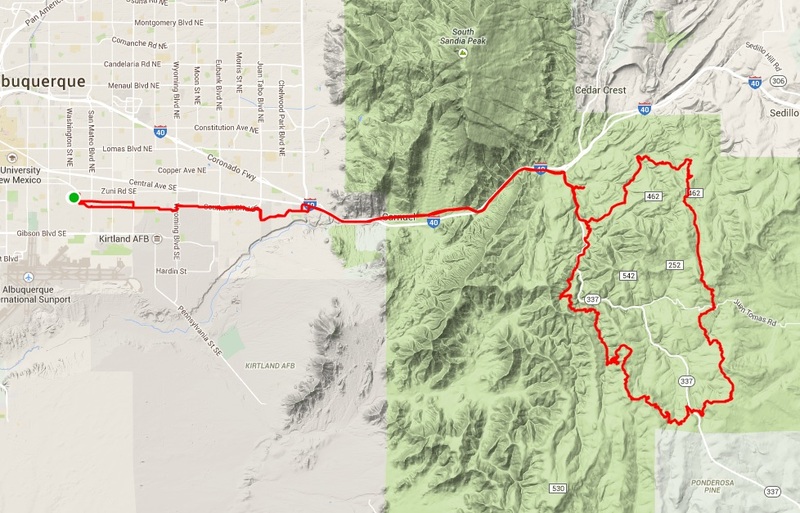 We did the Southern Crossing to Ponderosa, Gamble Oak, and Deadman for 16 relaxed miles in the warm afternoon. When I got home an AMRC pageout stated someone was involved in a 20' fall and had head and leg injuries. I rushed to the crest parking lot, and jogged 3 miles with Frank and Supra to the base of Chaos Crag (by Yataghan). When we got down there, we found that a UNM Reach and Treat and APD were already on scene and they said there was no head trauma, and no major swelling of the feet or legs. The helo was called off and we walked the patient to the La Luz Trail and littered him the 5 miles back down to the TH over 4 hours of agony. Fortunately, there was a lot of help and we moved fairly fast. AFD was nice enough to give us all a lift back to our vehicles and we signed out at 1:30am. I was in bed at 2:30 and made no attempt to make it to work on time Monday. I was out in San Francisco for the SunSpec Alliance meeting last week. I managed to get a couple hours free the morning after the conference and rented a CitiBike to cruise around the Embarcadero. Nice to be in my old haunts on a nice warm day. Jason was out on Friday and we hiked the rocks. Gorgeous sunset as always. On Saturday Jeff and I met up with Mike and the outdoor rec river crew to do some laps on the racecourse. If I wasn't busy with mountain rescue the next few weeks, I would consider becoming a guide with that outfit. I layered up in my wetsuit and dry top so the cold wasn't too bad - Jason even ran it in the IK and was comfortable. We had 4 boats of 3 paddlers and ran it at 1000-1100 cfs, which gave it a nice pace, a few more options for lines, and lots of excitement when we high-sided on Big Rock (twice!). Some of us grabbed dinner at Taos Mesa Brewing and then camped out by the Taos Junction Bridge. In the morning, Jeff and I headed up to Taos for the (original) closing day. We met up with Jason, Mugzy, and Victor and did a few runs and a lap on Kachina. I wore a onesie for fun (the tradition continues). In the afternoon, Jeff jumped in the Lego Man costume for the pond skimming competition. Only a few people made it across, and when he lost sight of the first jump's landing, there wasn't hope for him in the pond. Great time and Jeff managed to get 2nd place (primarily for the awesome costume)! 11 inches of snow had fallen in the last two days, so I snuck off with Jason at 5am on Friday to rip the heavy late-season powder. It was definitely one of the best days of the year - complete with 6 ridge hikes (Fifth Chute, Tresckow, Cuervo, High Somewhere, Two Bucks, and Juarez). I discovered the Martini Tree and we got dinner at the Bav. Jason tried to drive me up closer to the Yurt but the Northside crew turned us back. Instead I got to skin the full 2 miles with a well-loaded pack. After 1.5 hours, I got to the yurt as the dark got too thick to see anymore. Exhausted, I got the cabin fire going, turned on the gas lights, and cooked up some tea. Eventually, I made my way into my sleeping bag, but Josiah, Briana, and Mike arrived right as I was falling asleep about 10:30. At 1:30, they finally turned in after giving up on Bonnie and Dave. But, lo and behold, D&B did make it in after 2am, after postholing for much of the upper stretch of the hike. I finally got shut eye sometime after 2:30, gah! The next day, Mike and I risked the considerable to high avalanche danger to make a low-angle adventure towards Wheeler. We climbed up close to Fraser Mountain, had a summit beer, summitted Bull-of-the-Woods mountain and then skied tight trees back to the yurt. It was a fun little tour and great to ski in the Taos backcountry again. After the inbounds crew returned, the party kicked up and I cooked up a monster pot of rice, beans, mushrooms, and onions for everyone. As we were about to turn in, and to everyone's surprise, Kaela and Kelley showed up around midnight! We rallied and busted out the twister and charades. Sunday, we worked our way down the icy death luge back to Twining. By the time we were skiing, the sun had baked the snow and it was hero spring conditions. I finally got to take a couple laps on Kachina with lift service!! I appreciate the ease of skiing mainstreet and the K Chutes, but it's moguled up, top to bottom, so it's not nearly as fun as it used to be. And the summit experience isn't the same as when you had to hike 45 minutes to the top. Oh well, I'll be happy when they open up Lake Fork Peak as a sidecountry run. I've been going to a Weds night mountain bike ride organized by an inspirational couple, Karl and Rose, who as retirees still race mountain bikes at the CAT1 level. Their house is filled with cycling trophies and they bike everywhere around town. The night rides have been by headlight until recently, and the 10-12 mile ride is great at breaking up the week. Plus, they've been nice enough to invite the rest of the crew in for soup or chips/salsa after each ride. We linked up to take a cruise around town with Bri and Josiah to a couple local breweries on a free Sunday and it was a blast. I took a Friday ride with Mike, Allison, Briana, and Josiah in the north foothills a couple weeks ago. The wind was howling so when I caught the downhill, down-wind stretch toward the Rock Garden, I let it fly! Everything was great until it wasn't. 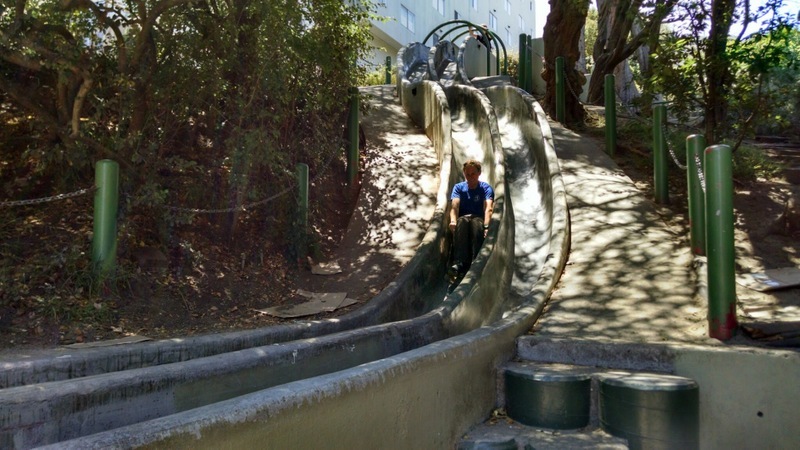 I caught a compression, and as I exited, I couldn't hold the turn and high-sided. The road rash got me on both knees and my chin. Dang! 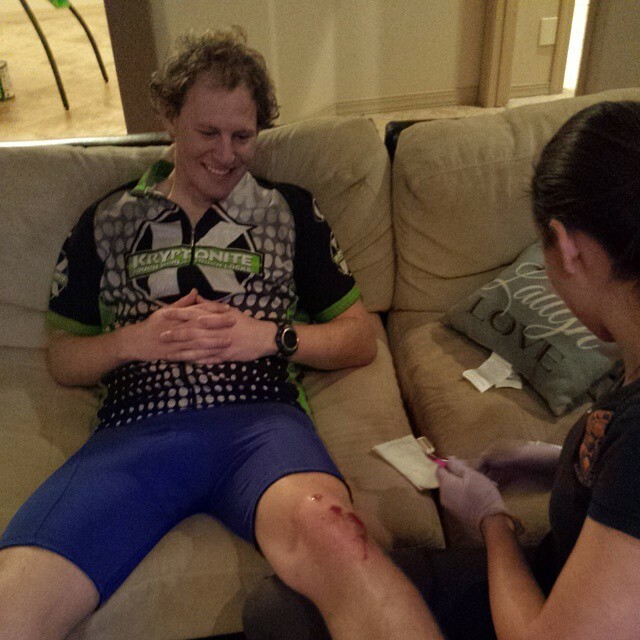 I decided the order of operations was to procure beer before scrubbing the wounds. Everyone headed back to Mike and Allison's house for a BBQ and I was lucky enough that Nurse Allison let me use the shower and then bandaged me up. Andy, Kendrick and I met up with the majority of the AMRC hut trip crew at the trailhead for the 4 mile and ~2000 ft skin to the Opus Hut. The snow was super warm so it caked onto our skins and gave my hip flexors more than their fair share of agony. We arrived exhausted but happy to be in the mountains. Surprisingly there was no staff to take care of us, so we made ourselves comfy. A couple beers later, night had descended but there was still no staff to cook dinner so we decided to cook up a big pot of spaghetti. (The following day we learned that there was some miscommunication with the staff and a last ditch effort was abandoned because of avy concerns.) All was well though - we fired up the sauna, built a ping pong table, and partied the night away. The following day we did low angle laps on the pass and got some nice turns in. The snowpack danger was high (4/5) so we knew we wouldn't be skiing anything super exciting. My hip flexor was angry so I didn't stay out too long, but I did take a sunset lap with Andy and Bill. The next day Justin and I tried to trigger an avalanche (while he was on belay), but no dice. The snowpack had solidified with the freeze thaw cycles. We skied some nice powder and then suffered back down the icy road to a Zia Taqueria lunch. Fun times with the mountain rescue family. "A group of friends from Albuquerque Mountain Rescue spent the weekend ski touring at the OPUS hut in Colorado's San Juans in March 2015. The full moon and strangely warm weather was perfect for slipping away from the extended apres party to snag a picture of the cozy building." I was asked by a my friends Todd and Kat to photograph their wedding over the weekend. I was a little worried and then the venue didn't make for easy photography - multiple light sources (natural and artificial) - but I did my best and the final product wasn't half-bad. I also tried out my new Altura Photo I-TTL Auto-Focus Flash for the reception. I was very impressed - the TTL technology is great for selecting the flash strength! 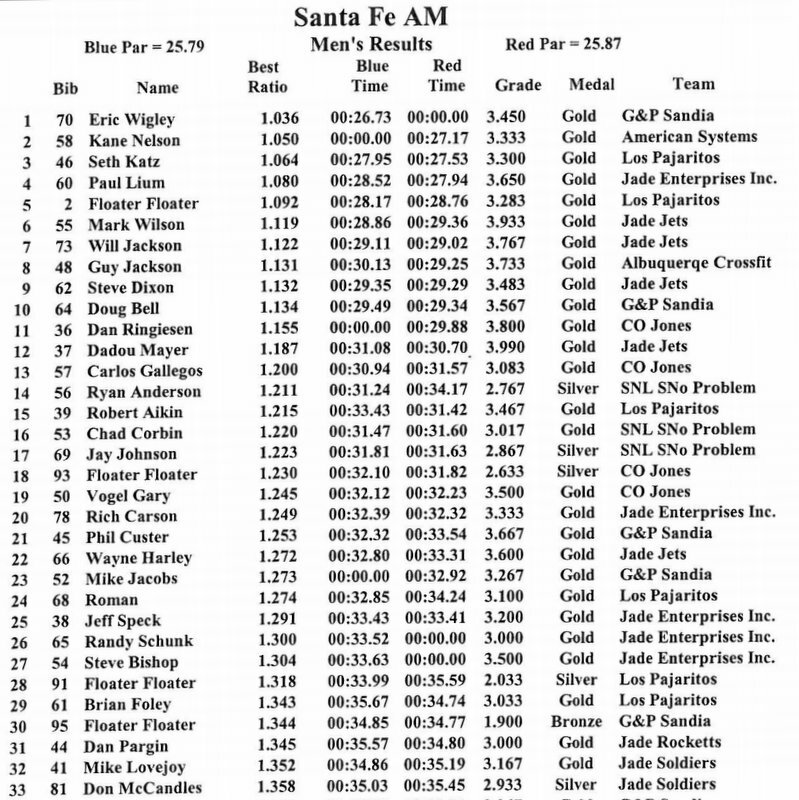 On Saturday I managed to redeem myself (at least partially) in the Santa Fe race with a 17/49 finish. Still no gold, but I felt I raced reasonably well. I skied the rest of the day with Chad and Nelson (a killer ex-CU racer from Steamboat). Anniken for a quick run in Hunzis - it was neeple-deep (bottomless) and I couldn't feel any bumps below me at all! I linked up with Jeff and Mario after that and jumped off the 7 footer by the base of the Kachina lift. In the process I managed to injure my hip; I don't know what it was about the landing (in a lot of powder) that caused it but I strained my quad somehow. Jeff jumped off next and tweaked his knee so there's something about that spot that isn't right. I did a couple more runs, but decided that I needed to recover. We went out to Taos Mesa Brewing and The Alley Cantina for Mario's birthday. Mike and Melissa also joined us for dinner at the brewery. The blues band was deafening though, so we had to head out early. I went 3/3 on shuffleboard at the Alley Cantina and then went back to Steve's to have a final beer with Mark and Sam. The next day, I decided at the last minute to ski, popped some ibuprofen, and sat in line all the way to the TSV. The crowd was the worst I've ever seen it - but I met up with Justin, Leigh, and RJ so we snuck around in the frontside trees. The powder was waist-deep! The best Taos conditions that I've ever seen. Justin and I kept running North American and then we caught Werner to Longhorn right after the rope drop. It was spectacular and I did the little rock drop without hurting myself! When people headed home, I fortunately ran into instructor Scott and skied until the last chair. Not bad for a cripple, but it was so fun all day, it was hard to resist. For Valentine's Day, Kaela and I went to the house party of house parties. First, the Mardi Gras crew biked through the barrio to old town plaza in full regalia tossing beads and blaring Gypsyphonic Mardi Gras Mixtape. A couple pubs later, we cruised back to the house to have gumbo and explore the party scene: love room, kissing booth, room filled with balloons, body painting, DJ zone, etc. What a celebration! I also paid the 1975 Saab 99 forward to Abe. The history of that ripping award-winning ('93 Saab autocross winner) car continues and now I'm down to a single vehicle! Mike and I drove up to Taos early on Saturday in the tail end of a Southwest blizzard. We found Leigh and Justin, Mark and Sam, Angela and Nick, Briana, Steve, and lots of friends out enjoying the 9" of powder. I had just replaced my Fritschi assembly on the Katanas after the toe piece break, but managed to forget to adjust them to the sole length or set the DINs. It was a little junkshow in the lift line while I hobbled around on one ski and tried to make adjustments with Mike's tiny pozidriver. In the end, I had to stop off at the patrol building and get things setup right. Then on the 2nd turn in Billy Sol I clipped a submerged tree, lost my ski, and had to spend a full 25-30 minutes looking for it in the powder until someone spotted it below me. What a powder day cluster! After meeting back up with folks, things improved and it was smooth sailing for the rest of the day. We got some good skiing in Werner's Right (tough), Juarez, and Lorelei Trees. When I got finished with my last run of the day, I saw Steve hanging around the base. He agreed to let us crash at his house in exchange for dinner supplies. We cooked up a great fajita dinner with a salad + spiralized cucumber and carrots. (I'm embarassed by how much I love that spiralizer.) The great thing about Steve's place is that it also comes with a hot tub and home brew! The following day, Mike and I skied with Briana all day. Taos opened the West Basin for the first time so we hit St. B's, Zdarsky, Stauffy Trib, and Waterfowl, which was chock full of rocks. Where the snow was good, it was great, but there was still plenty of dodging to do in the Basin, Pierre's, Reforma, Longhorn, Lorelei, Al's, etc. After 5 hikes, we celebrated the sunny day with a beer at the Bav and then pointed the Outback south again.